SpaceX is making significant progress in replicating the failure in the helium pressurization system that led to the catastrophic launch pad explosion of the firms Falcon 9 rocket during a routine fueling test at their Florida Space Coast launch complex on September 1. The problem at the heart of the anomaly appears to be in the helium loading system. However the root cause of the explosion still remains elusive at this time. “The Accident Investigation Team continues to make progress in examining the anomaly on September 1 that led to the loss of a Falcon 9 and its payload at Launch Complex 40 (LC-40), Cape Canaveral Air Force Station, Florida,” SpaceX announced in an Oct. 28 update. The company had previously said in a statement issued on Sept. 23 that investigators had determined that a “large breach” in the cryogenic helium system of the second stage liquid oxygen tank likely triggered the catastrophic Falcon 9 launch pad explosion that suddenly destroyed the rocket and Israeli Amos-6 commercial payload during the routine fueling test almost two months ago. “The root cause of the breach has not yet been confirmed, but attention has continued to narrow to one of the three composite overwrapped pressure vessels (COPVs) inside the LOX tank,” SpaceX explained in the new statement issued on Oct. 28. And SpaceX CEO and Founder Elon Musk had previously cited the explosion as “most difficult and complex failure” in the firms history. “Turning out to be the most difficult and complex failure we have ever had in 14 years,” Musk tweeted on Friday, Sept. 9. The helium loading procedures may well need to be modified, as an outcome of the accident investigation, to enable safe loading conditions. The explosion also caused extensive damage to launch pad 40 as well as to the rockets transporter erector, or strongback, that holds the rocket in place until minutes before liftoff, and ground support equipment (GSE) around the pad – as seen in my photos of the pad taken a week after the explosion during the OSIRIS-REx launch campaign. Fortunately, many other pad areas and infrastructure survived intact or in good condition. The company is conducting an extensive series of ground tests at the firms Texas test site to elucidate as much information as possible as a critical aid to investigators. The explosion took place without warning at SpaceX’s Space Launch Complex-40 launch facility at approximately 9:07 a.m. EDT on Sept. 1 on Cape Canaveral Air Force Station, Fl, during a routine fueling test and engine firing test as liquid oxygen and RP-1 propellants were being loaded into the 229-foot-tall (70-meter) Falcon 9. Launch of the AMOS-6 comsat was scheduled two days later. Both the $60 million SpaceX rocket and the $200 million AMOS-6 Israeli commercial communications satellite payload were completely destroyed in a massive fireball that erupted suddenly during the planned pre-launch fueling and hot fire engine ignition test at pad 40 on Sept. 1. There were no injuries since the pad had been cleared. The rocket disaster was coincidentally captured as it unfolded in stunning detail in a spectacular up close video recorded by my space journalist colleague Mike Wagner at USLaunchReport. SpaceX continues to work on root cause and helium loading procedures. The company also still hopes to resume Falcon 9 launches before the end of 2016. On Sept. 1st, 2016, aerospace giant SpaceX suffered a terrible setback when one of their Falcon 9 rockets inexplicably exploded during a fueling test. An investigation into the causes of the accident – which Musk described as being the “most difficult and complex failure” in the company’s history – was immediately mounted. And while the focus of the investigation has been on potential mechanical failures – such as a possible breach In 2nd stage helium system – another line in inquiry also came to light recently. In this case, the focus was on the ongoing feud between SpaceX and its greatest competitor, United Launch Alliance (ULA), and whether or not that could have played a role. Speculation about this possible connection began after three unnamed industry officials who were familiar with the accident shared details of an incident that happened a few weeks after the explosion. According to The Washington Post, these officials claimed that SpaceX had come across something suspicious during the course of their investigation. After pouring over images and video from the explosion, SpaceX investigators noticed an odd shadow and then a white spot on the roof of building located close to their launch complex. The building is currently being leased by ULA to refurbish their Sensible Modular Autonomous Return Technology (SMART) rocket motors – a key component in the company’s new Vulcan rocket. 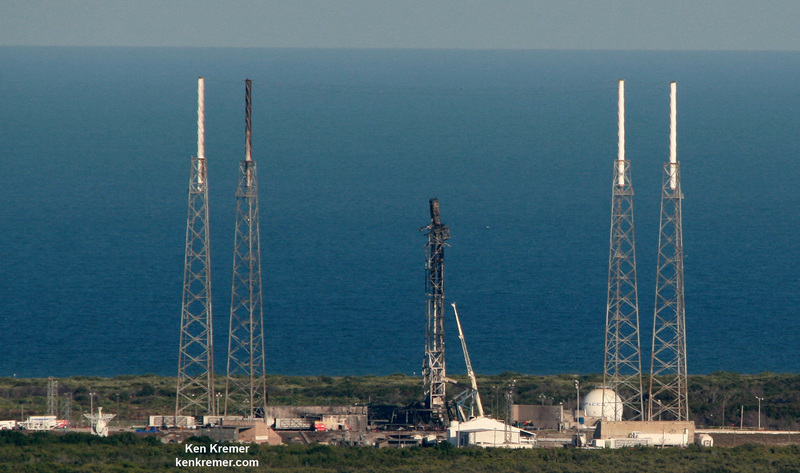 Located about one and half kilometers (1 mile) from SpaceX’s launch facilities, and has a clear line of sight on the launch pad. SpaceX dispatched an representative to check it out, who arrived at the building and requested access to the roof. A ULA representative denied them access and called Air Force investigators, who then inspected the roof themselves and determined that nothing of a suspicions nature was there. While the incident proved to be inconclusive, it is the fact that it was not previously reported that is raising some eyebrows. And it is just another mysterious detail to come from an accident that remains largely unexplained. However, in all likelihood the incident was avoided to prevent embarrassment to either company, and to avoid fueling speculations about possible sabotage (which seems highly unlikely at this point). In the meantime, SpaceX is still investigating the explosion with the help of NASA, the Federal Aviation Administration (FAA), the USAF’s 45th Space Wing. Musk commented on the ongoing investigation while attending the International Astronautical Congress in Guadalajara, Mexico. Whether or not sabotage is a realistic possibility, this incident does serve to highlight the rivalry between SpaceX and ULA. Prior to 2014, ULA was the sole provider of launch services for the US Air Force, until a lawsuit from SpaceX compelled them to open the field to competition. Since then, both companies have been fighting – sometimes bitterly – to secure national security contracts. It has also brought the issue of government oversight and accountability to the fore. On Sept. 29th, members of Congress Mike Coffman (R-Co) and Robert Aderholt (R-Al) sent a congressional letter to the heads of NASA, the US Air Force and the FAA expressing concerns about SpaceX’s recent accidents and the need for “assured access to space”. In other words, several Republican members of Congress hope to make SpaceX’s return to flight contingent on more stringent federal oversight. This may prove to be a source of inconvenience for SpaceX, which has stated that they intend to return to regular flights with their Falcon 9 rockets by November 1st. Clearly, something is wrong if technical failures are not being caught in advance. But then again, space exploration is a hard business, and even the most routine checks can’t account for everything. Nevertheless, if there’s one thing that the Space Race taught us, it is that fierce competition can lead to mistakes, which can in turn cost lives. As such, demanding that the federal authorities be on hand to ensure that safety standards are met, and that all competitors are being subjected to the same regulatory framework (without preference), might not be a bad idea. CAPE CANAVERAL AIR FORCE STATION, FL – More than a week after the catastrophic launch pad explosion that eviscerated a SpaceX Falcon 9 rocket during a fueling test, the bold and burgeoning aerospace firm is still confounded by the “most difficult and complex failure” in its history, and is asking the public for help in nailing down the elusive cause – says SpaceX CEO and Founder Elon Musk in a new series of tweets, that also seeks the public’s help in the complex investigation. “Turning out to be the most difficult and complex failure we have ever had in 14 years,” Musk tweeted on Friday, Sept. 9 about the disaster that took place without warning on Space Launch Complex-40 at approximately 9:07 a.m. EDT on Cape Canaveral Air Force Station, Fl. on Sept. 1, 2016. Both the $60 million SpaceX rocket and the $200 million AMOS-6 Israeli commercial communications satellite payload were completely destroyed in a massive fireball that erupted suddenly during a routine and planned pre-launch fueling and engine ignition test at pad 40 on Wednesday morning Sep. 1. “Still working on the Falcon fireball investigation,” Musk stated. Check out my new up close photos of launch pad 40 herein – showing dandling cables and pad damage – taken over the past few days during NASA’s OSIRIS-REx launch campaign which successfully soared to space on Sept 8. from the adjacent pad at Space Launch Complex-41. The rocket failure originated somewhere in the upper stage during fueling test operations at the launch pad for what is known as a hot fire engine ignition test of all nine first stage Merlin 1D engines, said Musk. However, the countdown dress rehearsal had not yet reached the point of ignition and the Merlin engines were still several minutes away from typically firing for a few seconds as the rocket was to be held down during the pre-planned hot fire test. “Important to note that this happened during a routine filling operation. Engines were not on and there was no apparent heat source,” Musk elaborated. Engineers were in the final stages of loading the liquid oxygen (LOX) and RP-1 kerosene propellants that power the Falcon 9 first stage for the static fire test which is a full launch dress rehearsal. The explosion mystery and its root causes are apparently so deep that SpaceX is asking the public for help by sending in “any recordings of the event” which may exist, beyond what is already known. “If you have audio, photos or videos of our anomaly last week, please send to [email protected] Material may be useful for investigation,” Musk requested by twitter. Indications of an initial “bang” moments before the calamity are also bewildering investigators. The explosion is also being jointly investigated by multiple US Federal agency’s. The incident took place less than two days before the scheduled Falcon 9 launch on Sept. 3. It also caused extensive damage to the rockets transporter erector, or strongback, that holds the rocket in place until minutes before liftoff, and ground support equipment (GSE) around the pad – as seen in my new photos of the pad taken a week after the explosion. However SpaceX has not released a full description of the damage to the pad and GSE. It cost approximately $15 Million to repair the Antares pad and flights have not yet resumed – nearly 2 years after that disaster. The Falcon rocket and AMOS-6 satellite were swiftly consumed in a huge fireball and thunderous blasts accompanied by a vast plume of smoke rising from the wreckage that was visible for many miles around the Florida Space Coast. Thankfully there were no injuries to anyone – because the pad is always cleared of all personnel during these types of extremely hazardous launch complex operations. “The anomaly originated around the upper stage oxygen tank and occurred during propellant loading of the vehicle. Per standard operating procedure, all personnel were clear of the pad and there were no injuries,” SpaceX reported in a statement. This also marks the second time a Falcon 9 has exploded in 15 months and will call into question the rocket’s reliability. The first failure involved a catastrophic mid air explosion about two and a half minutes after liftoff, during the Dragon CRS-9 cargo resupply launch for NASA to the International Space Station on June 28, 2015 – and witnessed by this author. All SpaceX launches are on hold until a thorough investigation is conducted, the root cause is determined, and effective fixes and remedies are identified and instituted. After the last failure, it took nearly six months before Falcon 9 launches were resumed. Any announcement of a ‘Return to Flight’ following this latest launch failure is likely to be some time off given the thus far inscrutable nature of the anomaly. The planned engine test was being conducted as part of routine preparations for the scheduled liftoff of the Falcon 9 on Saturday, September 3, with an Israeli telecommunications satellite that would have also been used by Facebook. SpaceX is simultaneously renovating and refurbishing NASA’s former shuttle launch pad at the Kennedy Space Center at Pad 39A – from which the firm hopes to launch the new Falcon Heavy booster as well as human rated launches of the Falcon 9. SpaceX has indicated they hope to have the pad upgrades complete by November, but a lot of work remains to be done. For example the shuttle era Rotating Service Structure (RSS) is still standing. The timing for its demolishment has not been announced.